Hugh over at Hugh’s Views and News holds a weekly photo challenge I have wanted to participate in, but haven’t gotten around to it…until now!! When I saw this weeks challenge, I just had to join in. These photos were taken by my daughter, our resident photographer 🙂 she sees things in her own perspective, and I love that. The photos I am sharing are actually taken from my mom’s house, which is where we live. When people visit for the first time, they are fascinated at how she has it decorated. We have vintage things all over the place. She has many collections that she has on display, there is so much to look at, yet it is not overkill. 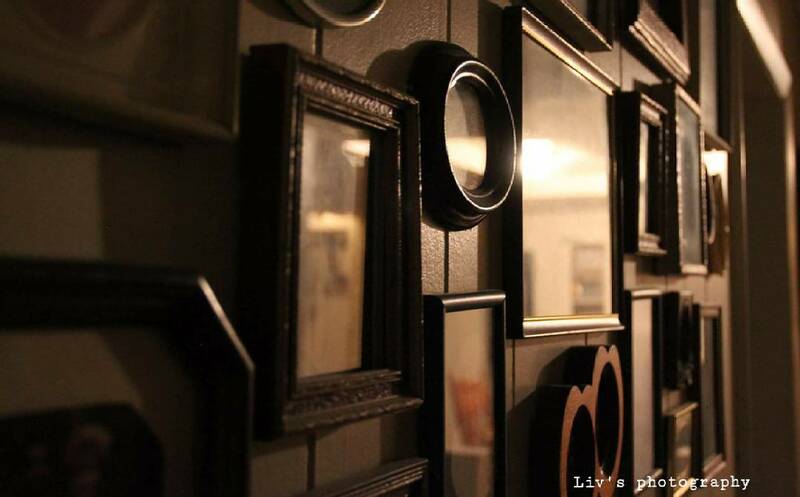 This is the photo wall filled with wedding pictures and family photos. Wedding pictures that are of her grandparents, as well as my dad’s grandparents. The old black and white photos, without any real happy smiles are hauntingly beautiful. It’s fun to see the family resemblances from generation to generation. This is part of a punch bowl set, that was my great-grandmother’s. The base of the punch bowl can also be used as a candy dish. It is made of what they call carnival glass. My mom no longer has the punch bowl, because it mysteriously broke. My great-grandmother suffered from Alzheimer’s and Dementia, and when she was really getting bad, my mom was washing the set, being as extra careful as she always did, putting down towels, so that none of the pieces would touch any hard surfaces causing them to break. 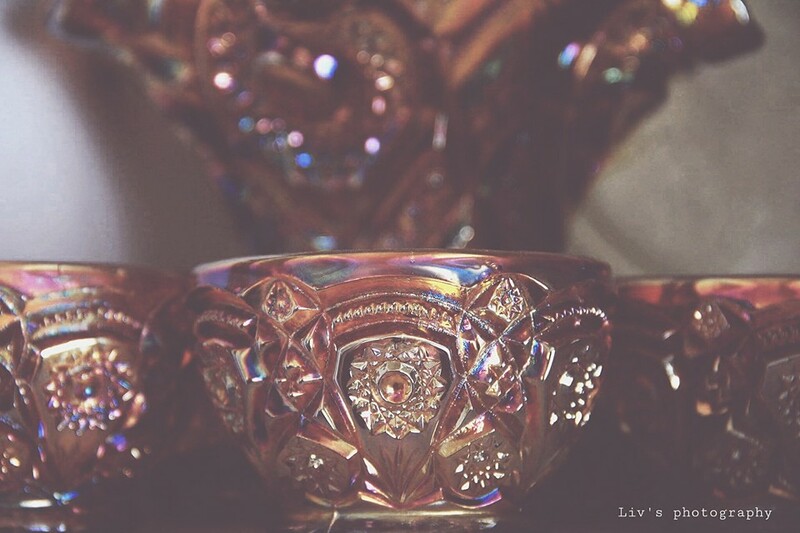 When she picked up the punch bowl to wash it, it did not touch anything, yet it shattered. She noted the time on the clock thinking that she would come to find out that my great-grandmother had passed, but that was not the case. She still does not know why it broke like that, and she was not injured as well. I’m not sure if I was supposed to share more than one photo, but this is the last one. I actually just took this one. It is in the little nook under our stairs. An old typewriter, sitting on a Singer Sewing machine. 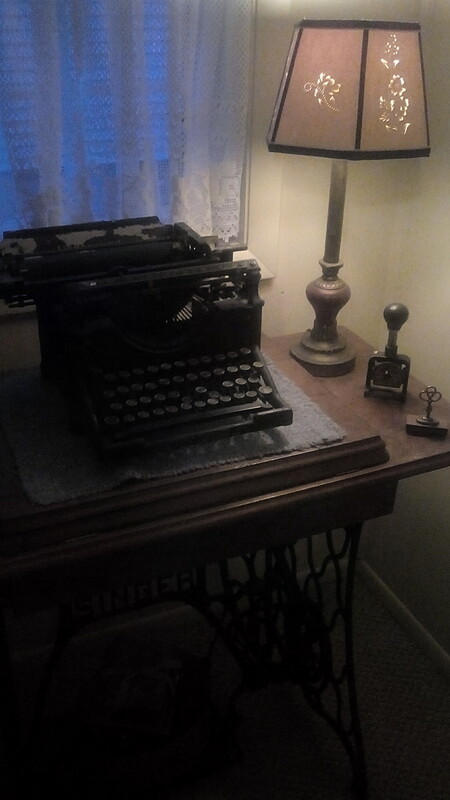 I just had to include the typewriter. Congratulations, Carrie Ann, I have featured your entry to my recent photo challenge on my blog. Thanks for the feature Hugh!! It was fun participating. Hope to join in again when inspiration strikes!! Such beautiful photos Hon! Hauntingly so. Love the story about the punch bowl. 😉 Weird – but so cool. I wish you were closer and we could go antiquing. ::sigh:: But I’ll settle for kindred spirit blogging Pal. Thanks Candice. Life has been crazy, trying to keep writing as much as I can, wish I had more to visit my blogging friends, miss ya too. This past blogbattle, I retuned the story I started on your Monday’s Muse, check it out, hope you like the new edition. I have no doubt that i will like it since i am a fan of your style. And I totally understand! Time can be so fickle. I love those old sewing machines. Classic! I don’t think there are many folks alive that would know for sure if it works. 🙂 They make EXCELLENT tables though. They’re gorgeous. YOU are welcome, Carrie Ann. Hi, Carrie Ann. Thank you so much for sharing these vintage items with us. That is certainly a mysterious story about the punch bowl shattering. We’ll probably never find out what it was that made it shatter. I love the old typewriter. One of my first jobs was selling these wonderful items. Okay, it was the electric version, but I do love the sound of a manual typewriter when it is being used. Thanks so much for participating in this week’s photo challenge. Thanks Hugh!! I also love the sound of a manual typewriter, that’s what I learned on, hard on the fingers, but the sound of the cadence from a room full of typewrites…priceless! !